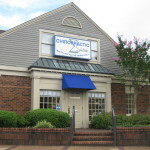 Chiropractic Solutions’ office is conveniently located at the intersection of South Memorial Parkway and Boulevard South in the Main Street South Shopping Village. 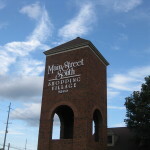 Boulevard South is the intersection between the Martin Road exit and Byrd Springs Rd intersection (and traffic light). When you turn into the parking lot off of South Boulevard, we are in the first building to the left, with convenient parking available directly in front of the door or handicapped access on the side of the building. 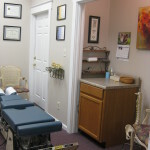 See our LOCATION page if you need detailed directions. 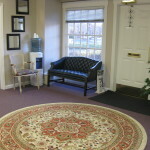 Our spacious reception area is homey and comfortable and provides magazines for your entertainment in the event that you have to wait for a few minutes for your appointment. We also have a children’s area well stocked with books and toys to keep the young ones occupied when they’re not in with the doctor. 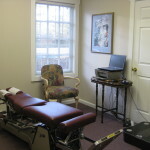 We have three individual treatment rooms in addition to an examination/X-Ray room. 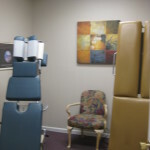 Call our office at (256) 650-0051 for an appointment today!